Contrary to what you have long been told, fat is not your enemy. Even if you are trying to lose weight, there are certain types of fat that you should always include in your diet. Fat that is an integral part of any weight loss plan. You might be surprised to find out that in addition to certain fats from nuts and vegetables, you should also include saturated, animal fats. You have long been told that these fats will cause heart disease, high blood pressure, cancer, and a number of other life-shortening diseases, but the experts have been wrong for a long time. Learn more about fats, what they are, which ones you must avoid, and the huge impact the good ones can have on your health. Fats are one of three main categories of macronutrients in the human diet. We consume fats, proteins, and carbohydrates primarily for energy. Each macronutrient is a different type of molecule that provides a certain amount of energy, but also meets other needs. Fats provide more energy by mass or weight than protein or carbohydrates. They also provide us with a vehicle for the intake and absorption of important fat-soluble vitamins and they give structure to the membranes of all of the cells in our bodies. Fats are the basis for other important molecules in the body including hormones. Your brain and nervous system require ample healthy fat. We also need fat for insulation, as warm-blooded animals. There are many different kinds of fats found in the foods you eat and nutritional labels don’t always disclose each and every one. To learn more about what fats are, where they come from, and how they can be healthful or unhealthful, you need a basic lesson on the variety of fats in foods. Chemically speaking a fat, or a fatty acid, is a molecule that has two parts: a small “head” that can dissolve in water and a longer “tail” that cannot dissolve in water. The tail is a chain of carbon atoms and its structure and shape is what distinguishes the different types of fats. Saturated fats – These are fats that have straight and rigid carbon tails. This structure allows saturated fats to stack up in an orderly fashion, which makes them solids at room temperature. Saturated fats are found in animal products and in tropical oils like coconut oil. Saturated fats are more stable, and less likely to go rancid, at high temperatures than unsaturated fats. Unsaturated fats – These types of fats have carbon tails with bends or kinks in them. The bend means that they cannot stack up and so they tend to be liquids at room temperature. Monounsaturated fats – Mono means one, and these fats have one bend in their carbon tails. Vegetable oils like olive, almond, and peanut oils, as well as avocados contain these fats. Polyunsaturated fats – Poly means many. These fats contain more than one kink in their carbon tails. Unlike saturated and monounsaturated fats, your body cannot make polyunsaturated fats so you need to consume them through your diet. They are very unstable at high temperatures and shouldn’t be used for cooking. You can find polyunsaturated fats in corn, soybean, and canola oil, walnuts, fatty fish, flax seeds, sesame seeds, sunflower seeds, and soy. Trans fats (also known as hydrogenated or partially-hydrogenated oils) – Trans fats are unsaturated fats that have been processed to become saturated. This is typically done to vegetable oils to make them solids at room temperature so that they will not go rancid as quickly. Vegetable shortening and margarine are made of trans fats. You will also find trans fats in many packaged and processed snack foods and baked goods because it gives them a longer shelf life. Think of these as liquid plastic. Omega-3 and Omega-6 fatty acids – These are two types of polyunsaturated fats that you need to consume because your body cannot make them. They are also known as linolenic and linoleic fatty acid, respectively. Omega-3 fats are found in walnuts, fatty fish, hemp, flax, and chia seeds, and soy. Omega-6 fats are found in hemp seeds, and soybean, corn, sunflower, canola, and safflower oil. Cholesterol – Cholesterol is not really a fat, but it is related to fatty acids. It is a molecule that is necessary for the proper structure and functioning of cell membranes as well as for the building of hormones and vitamin D. Your body makes cholesterol, but you also need to consume it. It is found in all animal products. For decades we have been told that saturated fats and cholesterol are bad for us and that any kind of unsaturated fat is better. In the 1990s we even went through a phase of believing that all fats are bad. The fat-free diet took hold and its followers ate foods marketed as healthy and low in fat. Those foods were not only missing this vital nutrient, but they were often packed with refined sugars and white flour, which we now know to be the real culprits when it comes to poor nutrition. The idea that fats are always bad really stuck and has been hard to shake off. Many of us still cringe when we eat something that is high in fat, even if we know better. The truth is that you can’t survive without fat. It is essential to the human diet. Fat fills you up and helps you to feel satisfied. It gives you energy and helps your brain function. On a low-fat diet you can expect to feel sluggish. Your skin will dry out and you will feel cold. If you want to lose weight, or just maintain a healthy lifestyle, you must eat fat. Even as we began to reject the idea of eating low-fat, sugar-laden foods after the fat-free diet craze went out of style, we still demonize saturated fats. Decades of flawed research has convinced many experts that saturated fats are detrimental to health. The truth is that you need saturated fats. More recent research has shown that they are not only important for cell membrane structures, but that saturated fats also help to bolster the immune system, contribute to bone structure, and protect the liver. Decades-old research that has linked saturated fat intake to cholesterol levels and heart disease are now being proven incorrect. Doctors and other experts have been pushing the benefits of polyunsaturated fats and telling us to reject saturated fats for years. It turns out they had it backwards. 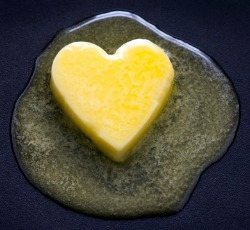 Saturated fats do not cause heart disease, and polyunsaturated fats will not protect you from it. Research from nearly 100 studies has shown that the amount of measured saturated fat, both in the diet and in the bloodstream of participants, is not related to heart disease. Scientists are recommending that groups like the American Heart Association change their guidelines. Most such organizations still recommend limiting saturated fats and getting more polyunsaturated fats in your diet. Another important piece of evidence that exonerates saturated fats and points to the real culprit for obesity and heart disease in Americans comes from comparing our western diet with that of other cultures. According to the U.S. Department of Agriculture, the top sources for calories in the American diet are grain-based desserts, yeast breads, chicken, soda and energy drinks, pizza, alcohol, and pasta. Carbohydrates, including sugars, are clearly our biggest dietary nutrient. Other cultures, with fewer instances of obesity and heart disease consume minimal carbohydrates and plenty of saturated fats. For instance, the Maasai people of Kenya eat mostly beef and milk. Their diet includes 66 percent saturated fat. In some Pacific islands, where the diet includes 60 percent saturated fats, the people rely on fish and coconut, which is rich in saturated fat. Saturated fats are not the enemy then. Does that mean that all fats are good for you? The answer is no. There are some kinds of fats that are bad for your health. One is found in many of our processed foods: trans fats. Hydrogenated and partially-hydrogenated vegetable oils are used in many packaged foods because they act like preservatives. They do not go rancid as quickly as unsaturated vegetable oils and give processed foods a longer shelf life. These trans fats contribute to heart disease and cancer risk. You should also avoid most vegetable oils that are industrially processed. These include soy, safflower, canola, sunflower, and corn oils. You should also avoid vegetables oils that have been heated during processing. The healthy fats that are in these oils are destroyed by heat. For this reason you should also never use them for cooking or frying. Another issue with these vegetable oils is that they contain far more omega-6 than omega-3 fatty acids, both polyunsaturated fats. Research on this is still developing, but it is starting to look like an imbalance of these two types of fats could be responsible for high levels of heart disease in the U.S. An imbalance has been shown to cause inflammation. The typical American diet includes far more omega-6 fats than omega-3, thanks to trans fats and vegetable oils. Also of note, these unhealthy vegetable oils combined with refined sugar create a one-two punch that wreaks havoc on the body. You now know which fats to avoid, but what does this mean for the foods you eat every day? Trans fats can be found in fried foods, packaged baked goods, margarine, frozen pizzas, and similar processed, packaged foods. To avoid them, you need to read labels. Food labels now include trans fats and you will see that many read zero. This can be misleading, however, as foods with less than a half a gram can be labeled as having zero trans fats. Check the ingredient list and if you see hydrogenated or partially-hydrogenated oil, put it back. Steer clear of any food containing any of the health damaging oils: corn, soy, safflower, sunflower, and canola oils. One way to avoid these unhealthy fats is to only consume whole foods in the form nature intended. You don’t need to read the label on a bag of carrots or bunch of kale. Shopping at farmer’s markets, co-ops, and buying clubs for real, whole foods, removes the need to meticulously study labels and fret over every last suspicious ingredient. Yes, that reads gorge on. Healthy saturated fats from tropical oils like coconut and palm oil. These are great for cooking and frying. They are a good alternative to the high omega-6 vegetable oils and are stable at high temperatures. Butter and dairy products (milk, full-fat yogurt, cheese, fresh and sour cream, colostrum), as well as meat, from animals that have been grass-fed contain high-quality saturated fats as well as other nutrients. Lard and tallow from pastured animals can become a staple in your diet like it was for our ancestors. Olive oil and nut oils that have been processed without heating, usually labeled as expeller-pressed, are also good sources of omega-3 fatty acids. Fresh coconut and avocado, as well as raw nuts, are also rich in healthy fats. Expeller-pressed sesame and flax oil are also healthful. For the full story on why butter is a true superfood, click here. As researchers continue to uncover the truths about fats, we can all learn to make smarter choices. Keep in mind that moderation is always important to any healthful diet. While certain fats are necessary and beneficial to your health, your overall diet should include a variety of fresh, organic, whole foods. You need a balance between proteins, complex carbohydrates, and healthy fats. As you begin to explore healthy fats, experiment with how you use them and remember that smoothies can be a great vehicle for most fats. Coconut and coconut oil, avocados, nuts, natural nut butters and nut oils, and even fresh butter can add richness and a new level of nutrition to your favorite recipes. A word of caution if you begin consuming more healthy fat and transition from a low fat diet. Take it slow and pay attention to your digestion. You may experience minor digestive discomfort as your body adjusts to digesting more fat. Increasing the amount of fat in my diet was a struggle, even after I knew how important it was. The low-fat dogma had been thoroughly implanted into my mind. It was hard to shake thoughts of guilt and weight gain while eating fatty food. If you experience this, just know you’re not alone. Now I consume butter with reckless abandon, coconut oil by the tablespoon, avocados galore, and fatty cuts of meat like a wild man :) Our taste buds have evolved to love fat because of its dietary importance. Enjoy healthy fats and feel good about yourself! Hunger pangs and the urge to snack in between meals is a thing of the past. Skipping a meal is no big deal. Fat is a superior fuel source, akin to a slow burning log on a fire. Burning carbohydrates or sugar for energy is akin to kindling, which burns fast and furious. I remember the days of needing carbs or sugar every couple of hours to stave off hunger pangs and feelings of irritation. My personal health journey began in earnest with smoothies. Many other dietary and lifestyle changes have positively impacted my health. However, I’m convinced eliminating the bad fats from my diet and incorporating plenty of healthy fats is the single most important thing I’ve done for my health. What are you thoughts on fat? Have you experienced health improvements from getting your fats right like I have? Please leave a comment below after enjoying some healthy fat without feeling guilty! A little bit like good sugar, bad sugar Ryan. I have wrestled for years with my glucose and a1c blood tests. Always watching for high carbs and sugar. I am borderline type 2. I’m new to smoothies but many have fruits that are high sugar so too much is not good. Some discussion on sugar and best way to get the right balance in smoothies when trying to keep carbs & sugar down would be very helpful. I love your approach to recipes with. Add on ideas. Keep up the good work. That’s the biggest problem with smoothies, too much sugar, resulting in what I like to call a sugar-bomb. Using too much sweet fruit and/or too much sweetener (even good one’s such as honey, maple syrup, and stevia) is the problem. If you stick to berries (and avocado) and incorporate a healthy fat (coconut oil or avocado) into your smoothies you’ll be fine. My advice is to use the least amount of sugar possible in your smoothies, especially if you have issues with it. I read once that adding protein may reduce sugar/carbs in the diet. Is that true? If you’re going to reduce the amount of sugar/carbs you consume, you’ll have to replace the calories with protein and/or fat. So, yes, you could say that’s true. I like smoothies. I would like to know if green smoothies can help me reduce my Lipoma. That’s a tough one. Green smoothies along with a healthy diet and lifestyle may help reduce Lipoma, but I can’t say for sure. This is a fascinating article. I’ve long been a fan of avocado and nuts, because they make me feel so satisfied. Great to read your information on this, Ryan. Thanks for this great site. You’re welcome. Nice to hear this info resonates with you because so many people have trouble accepting that fact that we need lots of healthy fat in our diet. loved the article! very informative. just started making smoothies for breakfast as opposed to my daily plain cheerios with skim milk. sounds like i did the rite thing! Fantastic site good clear info and I welcome your regular e-mails …. I keep it simple but vary it and can’t go a day without a smoothie …. My hair , skin and nails have benefitted … I bought cacao but haven’t managed to get a smoothie to my taste with this yet ! can you help . Thank you once again for your advice . Thanks! Always nice to hear when people are digging my content. Cacao on its own is pretty bitter. Make sure to add enough sweet fruit and/or sweetener to create a smoothie that’s chocolatey enough. Love this article. You’ve really steered me in the right direction. Thank you! Tried adding butter to my oatmeal and felt satisfied until 1pm! That never happens so I’m pretty excited. Wondering…Do you consider natural peanut butter a good source of fat? I’m elated to hear you love this article :) Getting your fats right is one of the most important things you can do for you health. I do consider natural peanut butter a good source of healthy fats along with other nut butters. I enjoy fresh ground peanut butter in my smoothies and on sourdough bread.